We at simpleshow foundation are huge supporters of the 2030 Agenda for Sustainable Development. With our Volunteer Initiative we provide anyone the chance not only to learn about the Agenda and its 17 Sustainable Development Goals but also to participate. By creating simple educational video resources, anyone can share their knowledge about the Goals and contribute to better awareness, understanding, and action towards achieving them. Goal #16 is one of the social goals of the agenda. 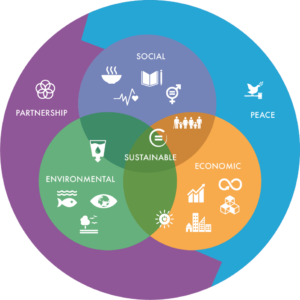 It is the core goal of one of the 5 dimensions of sustainable development. The goal entails different concepts of peace, for example, “positive peace”. This type of peace describes the attitudes, structures, and institutions that underpin and sustain peaceful societies. Read more about this concept here. According to the UN sustainable development report, the Goal’s aim is to “Promote peaceful and inclusive societies for sustainable development, provide access to justice for all and build effective, accountable and inclusive institutions at all levels”. Or to look at it from a different angle: Due to the absence of peace and the high number of losses, material, financial and over all human losses, for example in Syria, life expectancy has been reduced to 20 years and the only way out is to flee the country or simply live in poverty or try to survive. Our goal at simpleshow foundation is to make it simple to promote sustainable development and share amazing ideas and projects. With the help of mysimpleshow, an easy to use explainer video creation tool, and with the support of the foundation managers, you can contribute your time and knowledge and create educational videos that we can share with the world.